There are beautiful trams in Saint Petersburg that serve as public transportation and city icons. Anyone traveling in a will surely like to try a ride in this trams among many unique things to try in Saint Petersburg. Moreover, visitors will enjoy traveling the city in a relaxing way. The Saint Petersburg trams once had the largest tram network in the world, consisting of about 340 kilometers (210 mi) of unduplicated track in the late 1980s. However, many lines were removed, particularly in the city center. The trams system is a development after horse driven car. It also follows the Moscow trams usage inspired by American and British trams. The city laid many tracks rail network in Saint Petersburg proved a successful commercial venture. Trams development has some problems in the beginning due to endless rivery to horse carriages companies. However, the government step up and made some basic rules, then trams in Saint Petersburg start to decorate the city. In 2015 there are 41 tramway routes operate in Saint Petersburg. Over the years trams in Saint Petersburg develop in design, capacity, and decorations. Here are some of the beautiful trams in Saint Petersburg. They come in series numbers although vary is design. These beautiful trams consist of four-axle with three-door single cars. it is the first trams runs in Saint Petersburg and has modest features. It is manufactured 1973 through 1988 by PTMF. LM stands for «Ленинградский Моторный», or Leningrad Motor. LM68M later remodel into the LM-68 tram. This beautiful trams run the city with wide gauge and high floor and continuously welded four axle tram. Its body differs from the previous model to emphasized frame and removed glass on the roof. However, the pneumatic equipment has no changes. This is a very durable tram in width and length which capable of working as a multiple traction system. Most trams have six-axle just like this model. It has four-door articulated cars and goes through several redesigns. LVS-86 is a model from a Russian company where the first set of trams design by an American company. LVS stands for “Leningrad-made articulated tram” in Russian. LVS-86 spans 1,524-millimetre with two equal-sized sections around a center. Moreover, it runs with electric motors for brakes. Therefore, it is very safe. The trams have 27 seats able to take 327 riders when fully loaded. This model can also be linked together and controlled from a single cab. Other beautiful trams manufacture by Petersburg Tram Mechanical Factory or PTMF. A Russian company that stops working which require the city to do some modifications to their entire model for maintenance purposed. The LM-57 has streamlined forms, common for vehicles at the end of the 1950s. The First LM-57 had numerous chromized parts and emblem decoration in the front part. Moreover, it is so classy it earns the nickname Stilyaga(Russian Стиляга), meaning The Dandy for its external appearance. LM-57 tramcars worked Leningrad, Kiev, Tashkent, Gorky, Magnitogorsk, Saratov, Arkhangelsk, and Nizhny Tagil. However, many of this type are on the edge of complete exhaustion at this time. In additions, it develops some metal standard that may cause safety problems. The LM-57 is a single tramcar with no motor trailer modification nor ability for work in a train. Therefore, you can enjoy many famous places in Saint Petersburg at a slow pace by taking these trams. This is another beautiful trams from Leningradskiy Vagonoremontny plant from 1933 to 1939. The design takes many American bases and modified in accordance with Soviet domestic requirements. Moreover, it reduced the wide to simplify the shapes. This model is the first tram on this design from this company. The mass production consists of more than 300 trams with 49 seating capacity. In addition, it has long tracks that feature Saint Petersburg beautiful sceneries. Two copies of LM-33 inhibit the electric transportation museum in Saint Petersburg as a part of the city history. The typical six axles tram is another work from Ленинградский Вагон Сочленёный» (Leningradski Vagon Sochlenyeni). The LVS-97 tramcars operate in small cities in St. Petersburg, such as Kolomna, Krasnoyarsk and were also tested in Vitebsk. LVS-97K has several changes in control systems from a rheostatic-contactor control system, thyristors. Moreover, both received a rebuilt process into LVS-97A. Later on, it uses synchronous traction engines and rear section uses the low floor for passengers. This beautiful tram runs in the Ust Katav and Chelyabinsk Oblast part of Saint Petersburg. it runs until late 2007. Although these beautiful trams are old but serve as a reliable transportation for the local Russian living in Saint Petersburg. Local in Saint Petersburg live a more relaxed daily life. They are very different from the Moscow people. Therefore, trams go really well in this city. You will experience a different living style between the two cities. There will always something that amazes visitors when they go to this city. Even their street style will make you curious. The humid and friendly city of Saint Petersburg has warm vibes that attract people. The beautiful trams got its name from the company name Leningrad Motor or LM and the year when it is manufactured. 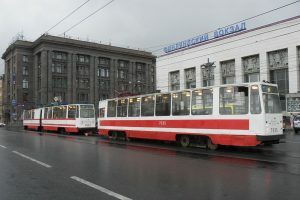 Moreover, the LM-49 tramcars were utilized in Leningrad and other cities such as Minsk, Gorky, and Magnitogorsk. This design has a unique nickname “Elephant”. Therefore, it is a quite famous attraction for tourist around Saint Petersburg. LM-49 worked in pairs with an unpowered wagon. The mass production of LM-49 the changes into a more newer model the LM-57. In general, Soviet tram drivers regarded the LM-49 as a very durable and reliable tramcar. However, its lacks on meeting the pressure to renew Soviet trams rather than risk failures from old age. Therefore, they are still fully operated when scrapped. You can see these models in Museum Nizhny Novgorod as a remembrance of Russian transportations. St. Petersburg is not only Russia’s former capital but also the former capital of trams. The city was the world’s first tram was invented and tested with the longest record-breaking tramway network up until 2002. It is the more reasons to visit Saint Petersburg. Anyone would like to enjoy the city like locals this beautiful trams worth to try.